Chad Owens' debut with the Saskatchewan Roughriders will have to wait as the wide receiver will start the 2017 season on the six-game injured list, the team announced on Wednesday. The Riders say Owens is still sidelined with a foot injury and will use Ricky Collins Jr. as their primary returner for Thursday's season opening against the Montreal Alouettes. Defensive back Tevaughn Campbell is also on the six-game injured list while wide receiver Rob Bagg, running back Kienan LaFrance and linebacker Jonathan Newsome will miss the game against the Als with various injuries. Saskatchewan signed Owens in February. 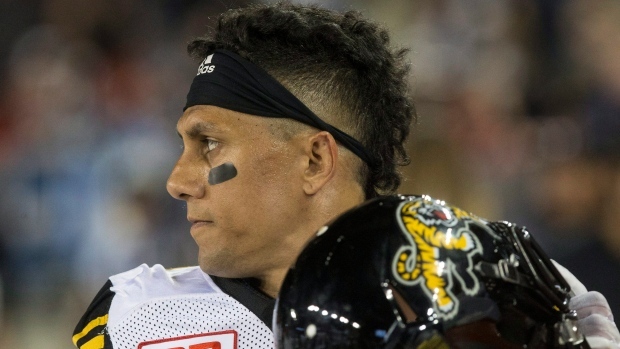 The 35-year-old native of Hawaii caught 58 passes for 808 yards and five touchdowns over 12 games with the Hamilton Tiger-Cats in 2016, his first and only season with the club. Owens has 504 receptions for 5982 yards and 26 touchdowns over 102 career CFL games, mostly with the Toronto Argonauts.